Craniopharyngioma is an uncommon tumor of the nervous system; it is well-known to recur even several years after surgery. Radiotherapy may confer a benefit and mitigate the chance of recurrence. We are here with reporting a case of craniopharyngioma which recurred at a site removed from the original site 5 years after surgery and radiotherapy. A 4-year-old girl was admitted for progressive deterioration of vision of 2 months duration. In addition, the family noticed she was not very active. There was no history of endocrinopathy, fits or any symptom of raised intracranial pressure. On examination, visual acuity was questionable perception of light on the right side and counting fingers at 3 m distance on the left. Bilateral optic atrophy was present. Neurologic exam was unremarkable otherwise. Imaging revealed a solid and cystic craniopharyngioma in the sellar-suprasellar region [Figure 1]a and b. She underwent a right frontotemporal craniotomy and transsylvian exploration and almost total excision of the tumor. Postoperatively, she developed dyselectrolytemia. Histologic examination showed an adamatinomatous craniopharyngioma. Postoperative MR showed a tiny residual tumor adherent to the pons [Figure 2]a and b. She was given a course of radiotherapy for this residue −54 Gy in 30 fractions. 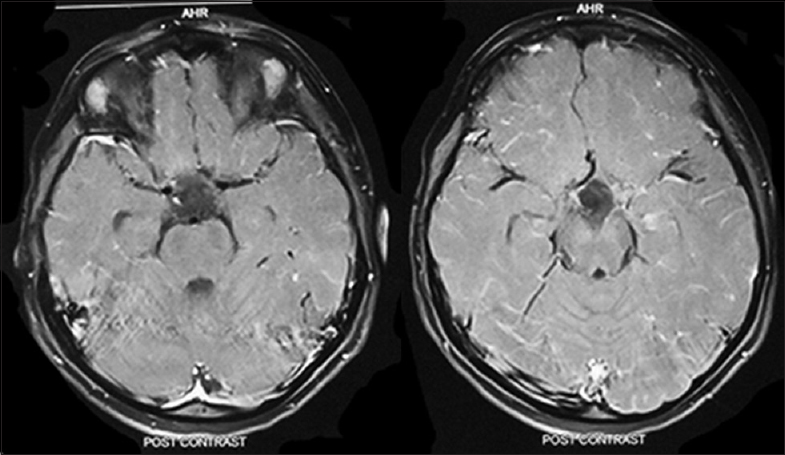 Follow-up imaging at the end of 2 years did not reveal any residual tumor [Figure 3]. She had improved well and was attending school. Replacement hormonal therapy was being administered. Imaging was being done periodically to check for recurrence. The 5-year surveillance imaging showed a recurrence in the right Sylvian fissure along the route taken during the first surgery. The tumor was solid and cystic in nature. There was no evidence of tumor in the sellar-suprasellar area [Figure 4]a and b. She did not exhibit any symptoms attributable to the recurrence. She underwent reexploration by the same route, and a tiny fragment densely adherent to the middle cerebral artery was left behind. Postoperative imaging has not shown any residual tumor. She continues to do well and is on replacement therapy. But eternal vigilance and regular imaging are mandatory to detect recurrences. Another point worthy of note is why this phenomenon is not seen with respect to other benign tumors like meningiomas or even malignant tumors. Schmalisch K, Beschorner R, Psaras T, Honegger J. Postoperative intracranial seeding of craniopharyngiomas - Report of three cases and review of the literature. Acta Neurochir (Wien) 2010;152:313-9. Bikmaz K, Guerrero CA, Dammers R, Krisht AF, Husain MM. Ectopic recurrence of craniopharyngiomas: Case report. Neurosurgery 2009;64:E382-3. Romani R, Niemelä M, Celik O, Isarakul P, Paetau A, Hernesniemi J. Ectopic recurrence of craniopharyngioma along the surgical route: Case report and literature review. Acta Neurochir (Wien) 2010;152:297-302. Ito M, Jamshidi J, Yamanaka K. Does craniopharyngioma metastasize? Case report and review of the literature. Neurosurgery 2001;48:933-5. Frangou EM, Tynan JR, Robinson CA, Ogieglo LM, Vitali AM. 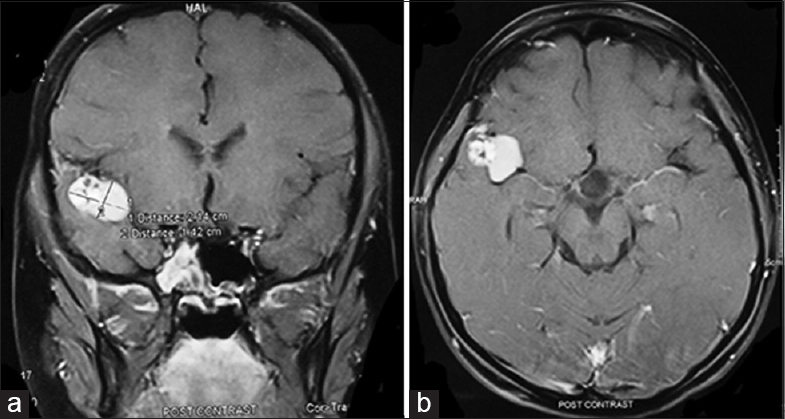 Metastatic craniopharyngioma: Case report and literature review. Childs Nerv Syst 2009;25:1143-7. Sangiovanni G, Tancioni F, Tartara F, Gaetani P, Rindi G, Passeri F, et al. 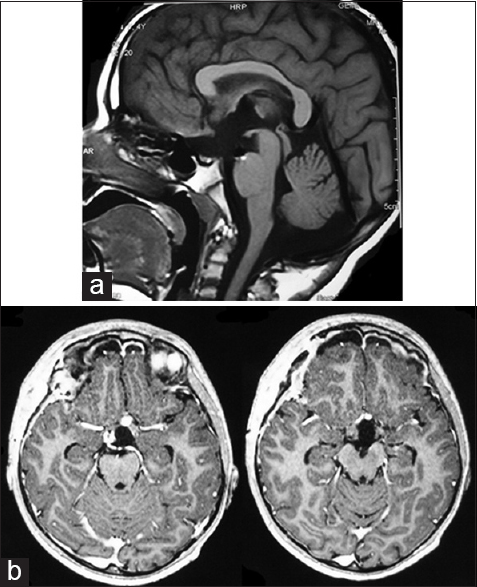 Ectopic craniopharyngioma: Presentation of a case arising from the corpus callosum. Acta Neurochir (Wien) 1997;139:379-80. Ragel BT, Bishop FS, Couldwell WT. Recurrent infrasellar clival craniopharyngioma. Acta Neurochir (Wien) 2007;149:729-30. Lermen O, Frank S, Hassler W. Postoperative spinal recurrence of craniopharyngioma. Acta Neurochir (Wien) 2010;152:309-11. Nomura H, Kurimoto M, Nagai S, Hayashi N, Hirashima Y, Tsukamoto E, et al. Multiple intracranial seeding of craniopharyngioma after repeated surgery - Case report. Neurol Med Chir (Tokyo) 2002;42:268-71. Elfving M, Lundgren J, Englund E, Strömblad LG, Erfurth EM. 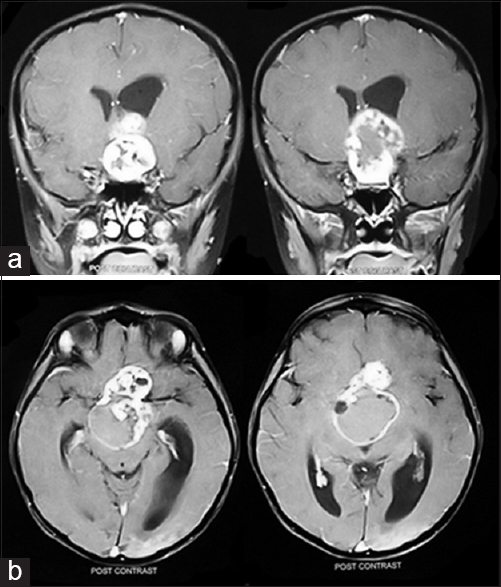 Ectopic recurrence of a craniopharyngioma in a 15-year-old girl 9 years after surgery and conventional radiotherapy: Case report. Childs Nerv Syst 2011;27:845-51.